Copycat Cheddars Honey Butter Croissants. Cheddars Honey Butter Croissants have to be one of my favorite menu items at Cheddars. Why? They are warm and flaky, and they are drizzled with honey butter. Cheddars, if you have never been there is a fantastic restaurant. Cheddars has been around since 1979, this restaurant serves up over 10 million of the Cheddars honey butter croissants each year! If you aren’t so lucky you may not have a Cheddars within driving distance, but you can recreate these buttery croissants at home. It’s really easy to make this favorite menu item at home. I don’t always flat out recommend a product, in this case, I will. What makes these so special is that they Croissants, they are not your ordinary quick bread that is often served up at a restaurant. Croissants take time, they take a long time. I recommend buying frozen croissants. You can find these at Trader Joes or even Sara Lee Frozen Croissants. Your store may carry another brand. You can use Pillsbury Crescent rolls, but keep in mind, while tasty, the Pillsbury Crescent rolls are not the same thing as real croissants. It’s pretty easy to work with those frozen croissants, but you will need to defrost them for 6 to 7 hours before you bake them, so be warned. You can’t make this impromptu just before dinner. I promise hot buttery croissants drizzled with honey butter taste like manna from heaven. Or at least these warm honey butter croissants is what I hope that manna from heaven tastes like. 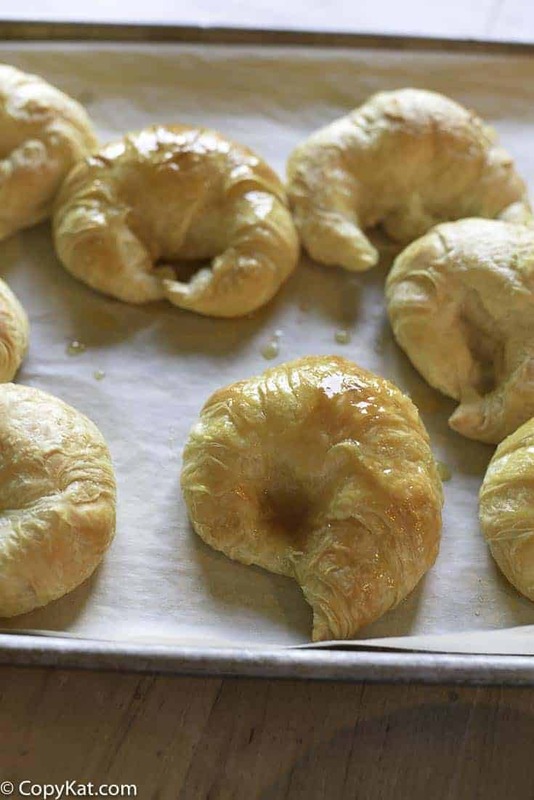 I hope you enjoy this copycat recipe for Cheddars Honey Butter Croissants. 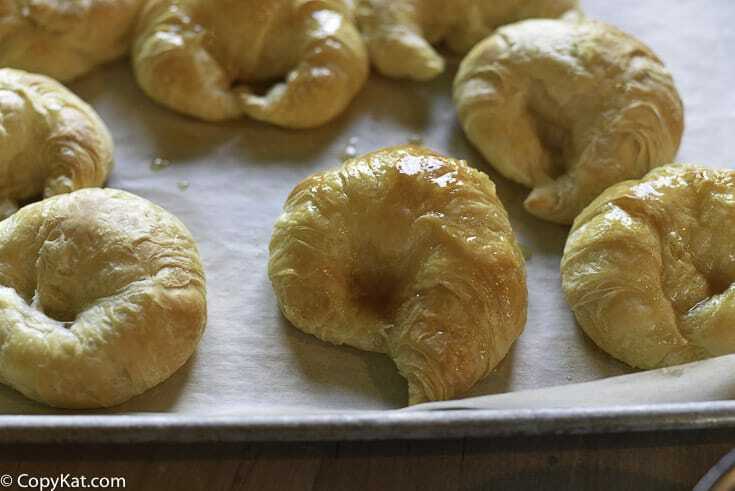 You can make those flakey honey buttery croissants just like Cheddars does! Follow package directions for proofing, these will take about 6 to 7 hours to thaw and proof. To bake them preheat the oven at 350 degrees F. While the croissants are baking in the oven, heat the butter and the honey together on the stovetop. Place the butter and honey in a small saucepan on low. Stir the butter and honey as they warm together. When the butter fully melts turn off the butter. Continue to occasionally store the butter and honey together until you spread the honey butter on the hot croissants.Bake the croissants for 15-19 minutes or until they are fully puffed up and browned. Remove from oven when the croissants are done. Allow to cool for 2 to 3 minutes, then drizzle the warm honey butter over the warm croissants. Hi, we recently were on vacation and stopped for lunch at Wintzell’s Oyster House in Greenville, Alabama. I learned they have the best bread pudding EVER after my husband ordered it for dessert. It is the first bread pudding I’ve ever liked! They of course wouldn’t give me the recipe and I’ve searched the internet for a copycat recipe. I certainly hope you can help me find one because I will probably never be able to visit that restaurant again. Thanks! Finally, we don’t have to portion these out, we can make plenty for everyone. Very simple recipe and yet looks so delicious! Sounds DELISH, but can you use fresh. already baked croissants? No, they are not already baked, they are frozen, you need to proof them to make them raise. These croissants are my favorite warm buttery indulgence! I could prob eat the whole batch lol! Thanks for the tips & great recommendations of using Trader Joe’s version! I would love if you would do Cheddar’s grilled honey mustard chicken with button mushrooms over rice dish! Cause nothing I make at home ever tastes as awesome as theirs lol. Thanks! You may not thank me if you make all of them 😉 We all gobbled them right now. Look forward to trying this!! Thank you, are there other menu items at Cheddars I should try? Hi Stephanie, love your recipes!! When we’re at Cheddars we usually get the grilled salmon, which is delicious, but we’re always impressed with the rice it is served over. Do you think you’d consider copying that? It’s rare to find a great rice side???? I will definitely keep it in mind.